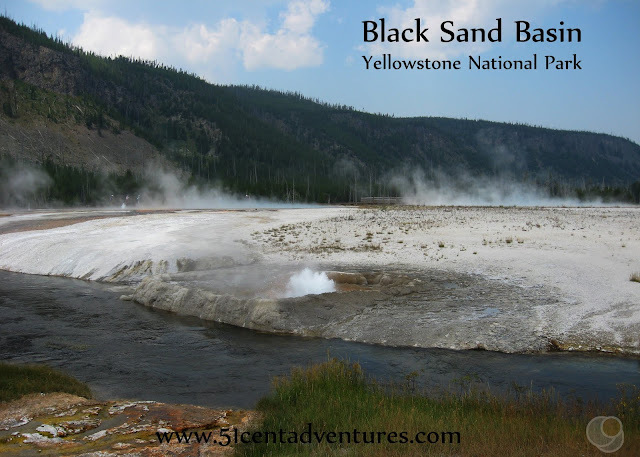 If you are visiting Yellowstone make sure you take time to visit the sights on the way into the park. Mesa Falls is located within an hour of the west entrance to the park. This spectacular waterfall rivals many of the falls within the park. Location: Eastern Idaho. One hour north of Idaho Falls, one hour south of West Yellowstone, 90 minutes north of Jackson, Wyoming. Cost: $5.00 per car. Free with America the Beautiful National Parks pass. Operating Seasons and Hours: Mid May to Labor Day 9:00 AM to 5:30 PM. In the winter the road is groomed for snowmobiling. 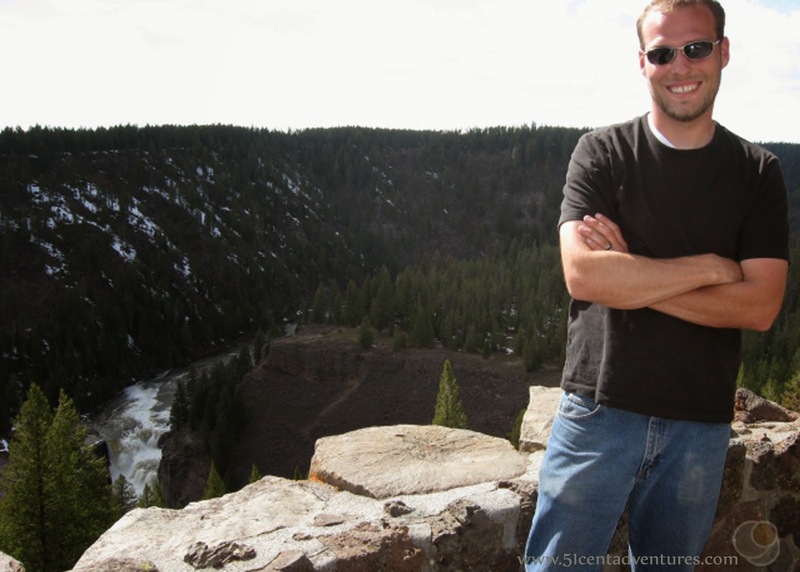 Brandon and I went to Yellowstone National Park in May of 2008 to celebrate our first wedding anniversary. The park is coming out of winters grasp in May. That meant there was still snow in the park. In some areas the snow had almost melted. In other areas it was a few feet deep. We had hoped to see the Upper and Lower Yellowstone Falls up close, but the viewing areas for the waterfalls were trapped in snow. Even the access roads to the parking lots for the falls were snow covered and blocked off with gates. We tried parking on the main highway and walking down the roads to see the falls. But the trails down to the view points were invisible under all the heavy snow. We wisely decided it would be too dangerous to try to make our own trails. We had to save viewing the falls from the edge overlook for another trip. We were able to see the falls from an view point that was located about a mile from the falls. We'd seen lots of amazing things during our 3 day visit to Yellowstone, but we were a little disappointed that we missed out on the majestic waterfalls. We drove through Idaho on our way home to Utah. We happened to see a sign advertising Mesa Falls and decided to try checking them out. 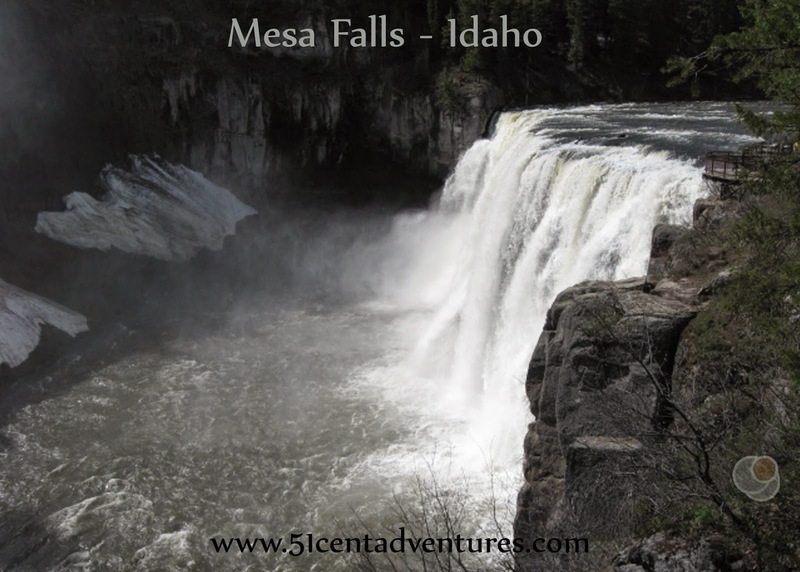 We'd never heard of Mesa Falls before, and we certainly didn't know what it looked like. It were only about 30 minutes out of our way so we decided we didn't have anything to lose by going to check it out. When we arrived at the parking lot for the falls ours was one of the only cars there. There was a little bit of snow on the ground, but the walk ways were clear. We were able to walk down to the edge of the falls. We were able to watch the water rush over the edge. It was very exhilarating. In many ways Mesa Falls was better than viewing either the Lower or Upper Falls in Yellowstone. The Yellowstone falls are taller than Mesa Falls, but they are also more narrow. The viewing area for Mesa Falls was more open than the cramped viewing areas for the Yellowstone Falls. Mesa Falls had a large viewing platform that extended up to the waters edge. I felt like I could reach out and touch the water. 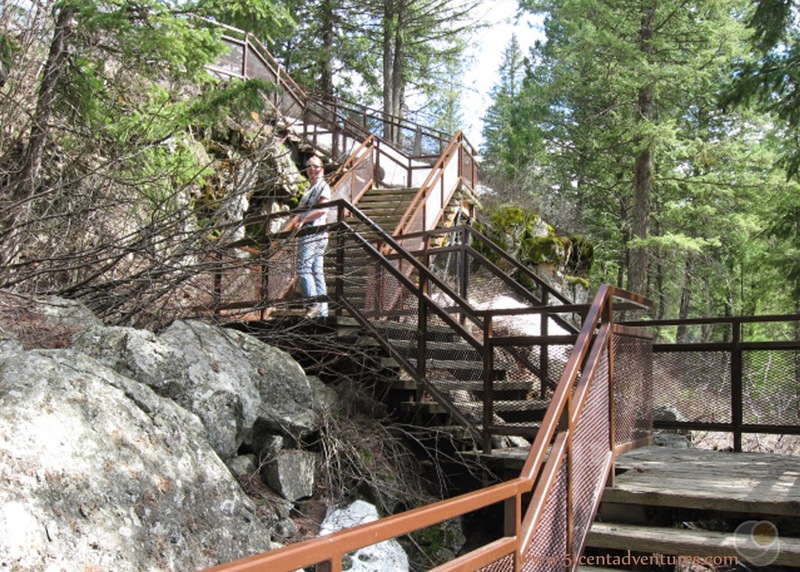 The viewing platform was like an extensive series of porches that allowed us to view the water fall from many angles. There were many stairs that connected the viewing platforms. Unfortunately there wasn't a ramp. In preparation for this post, I called the Visitor Center to find out if there are any wheel chair accessible areas. The ranger said that their is one viewpoint that you can reach without going up or down any stairs. It gives you a good view of the falls. You have to use stairs to get close to the falls. So keep that in mind if you planning to use a stroller or wheel chair on your trip. Mesa Falls turned out to be an unexpected - yet wonderful- addition to our trip to Yellowstone. I highly recommend visiting these waterfalls if you are in the area - especially if you don't get to see the Yellowstone Falls. And don't worry, Brandon and I were able to see Upper and Lower Falls on later trips to Yellowstone. In fact, we ended up living near them during the summer of 2017 when I worked in Yellowstone National Park. Directions: Mesa Falls Scenic Byway (highway 47) is a loop that branches off from Highway 20 about 15 miles north and south of Mesa Falls. If you are traveling south on Highway 20 take a left onto the scenic byway near Harriman State Park. If you are travelling north on Highway 20 take a right onto Main Street in Ashton. 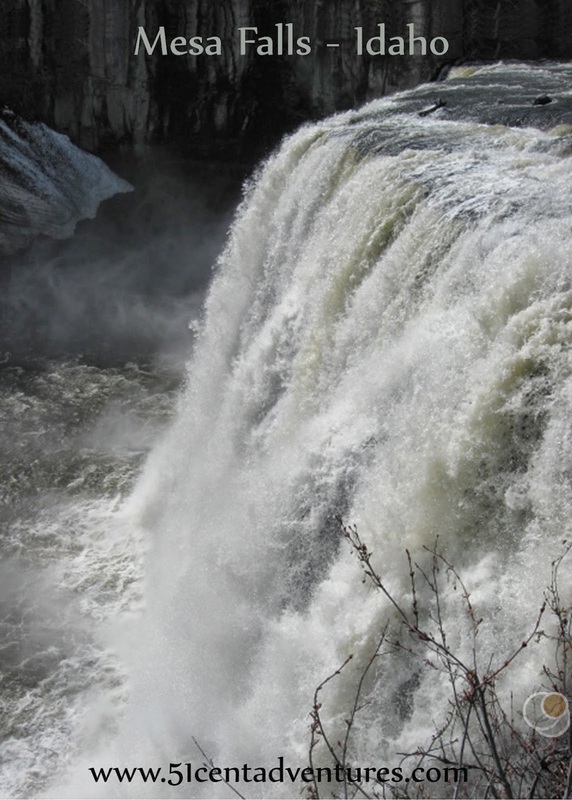 Main Street will turn to the north and become the Mesa Falls Scenic Byway. Places nearby: Highway 20 connects a lot of beautiful areas. Yellowstone is of course the main attraction, but the whole area is very charming. There are many places to camp and hike. The Island Park area is especially popular. 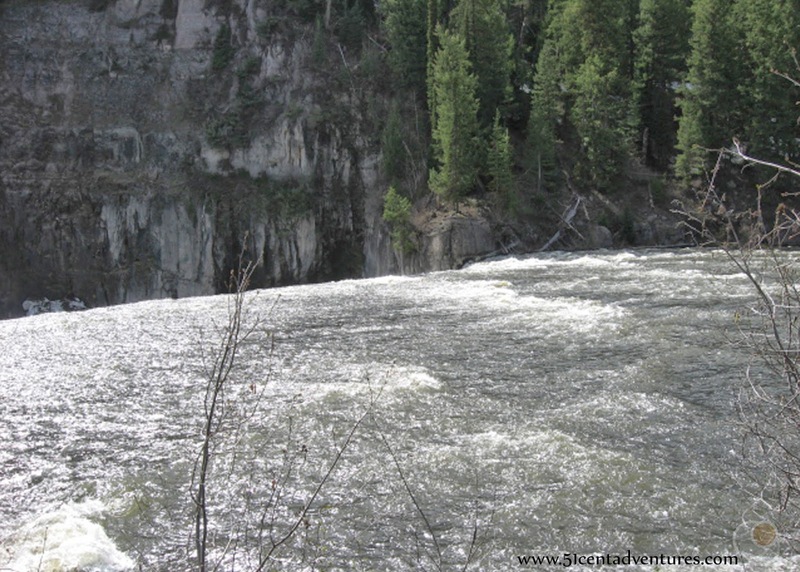 Additional Information: If you want more information about the Upper and Lower Falls of the Yellowstone check out this post that details the differences between them. Is a triple stroller right for you?